Classic responses to an event invitation. Frustrating responses. Nothing kills the buzz of an exciting event like lack of attendees. If you get people to come, hosting events can set your business apart. 84% of event attendees say they have a more positive opinion about the company after the event. Sounds great! Now you just need to get people to come. 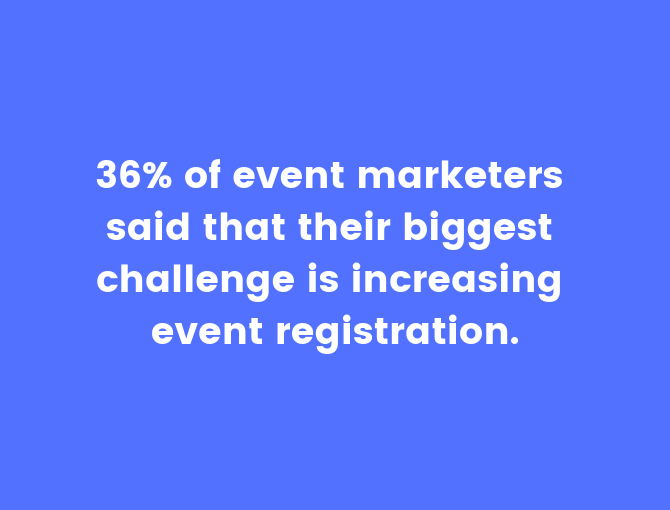 36% of event marketers said that their biggest challenge is increasing event registration. So, you’re going to need a rocking event email (actually, several). 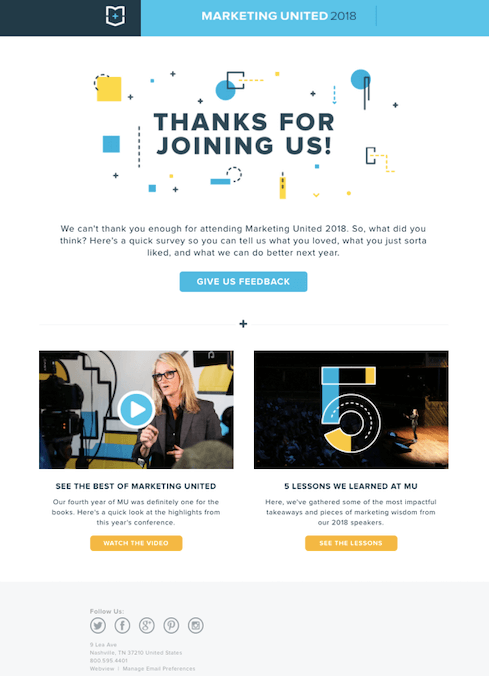 6 event email examples that make you stoked to hit ‘Send’ – and people excited to attend. Get ready to see your attendance rate soar. What kind of event emails should you send? What event emails will get people to show up? RSVP confirmation: Automatically send this to contacts once they confirm their spot. Give them all the details they need to prepare. Event info reminder to RSVPs: Remind people the event is coming soon (or follow-up with them afterward). 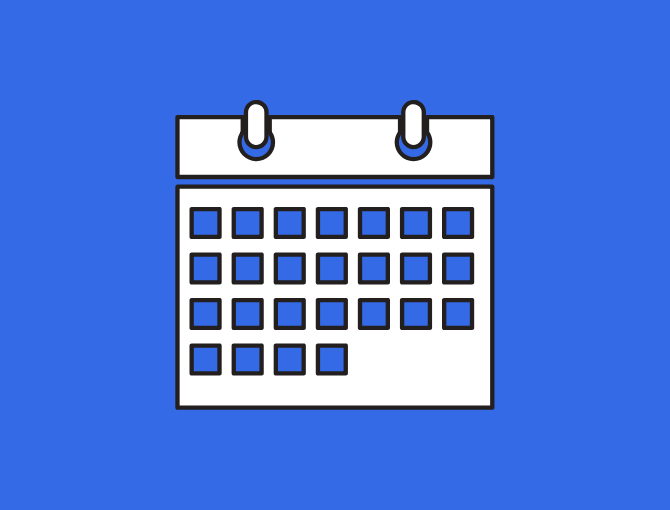 Among different categories of event emails (like festivals, sports, and classes) the most popular day to send business event emails is on Wednesday. It’s going to be a lot of emails. The easiest way to avoid spending a ton of time sending emails is automation. 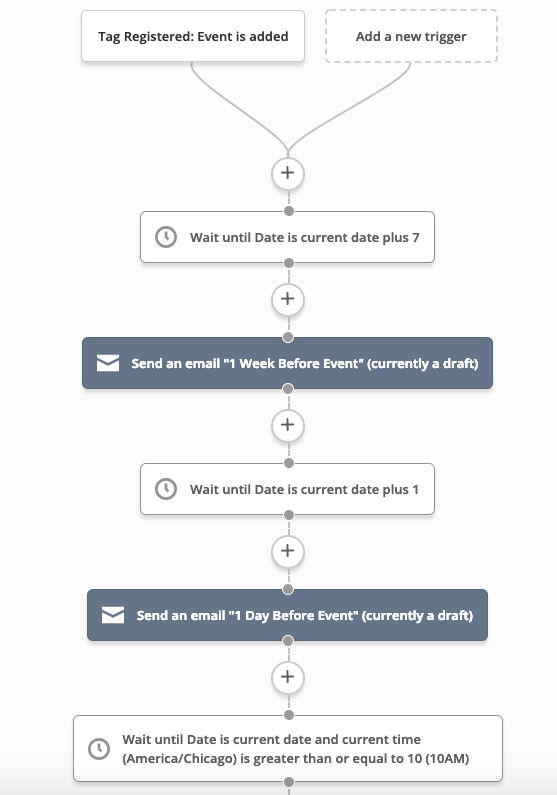 Here’s what event email automation could look like for you. This automated event email sequence shows an initial event email 1 week away, a reminder 1 day before, and a final email the day of. Each email is triggered by specific dates. You can use automation to send initial emails. Then keep people in targeted automations if they…. 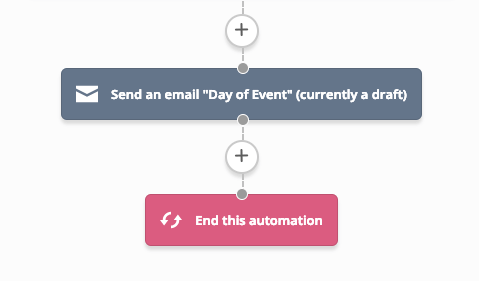 Automate your event emails and focus on organizing the rest of your event. Now check out these 6 event email examples (from businesses that send the best event marketing emails). In his book Influence: The Psychology of Persuasion, leading psychology professor Robert Cialdini names social proof as one of his 6 core principles of persuasion. What is social proof? Keep reading. Adding a picture to the testimonial makes it more trustworthy. Answer – they want to fix their problems. 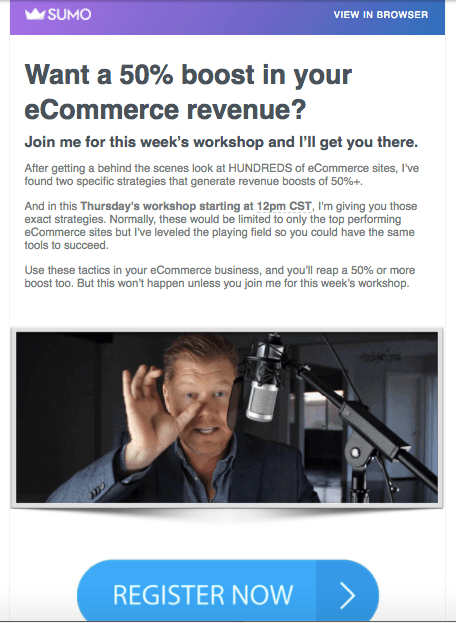 This webinar invitation email asks questions to pinpoint customer problems. Then, in detail, it shows how the event will solve them. Who would say ‘No’ to that much money? This Sumo email headline and copy give an obvious value proposition: two strategies to get you to a 50% boost in revenue. What you get from the event is crystal clear. Why is this copy so impactful? Numbers. They grab attention and add credibility. People love to save money and hate to miss out on opportunities to save money. Warning of a price increase might just be enough to light a fire under people who didn’t take advantage of the first invitation email. The psychology behind this is called the loss aversion. People want to avoid losing things (and you can use that). If you make your customer feel like they are going to lose something by not acting, that’s loss aversion. When you dangle the idea of an offer slipping away, people are more likely to act in a hurry. In this case, what you can’t afford to lose is the lower ticket price. I’m going to call out two specific words in this email. Can you guess what they are? You and your. Here’s why those words matter. “You” is the most powerful word in the English language. People care about themselves the most. Brian Clarke, the founder of Copyblogger, talks about the power of “you” in this post. The word “you” makes your writing personal. It puts the focus where it should be (on the customer). Like he said, ultimately you care about yourself most. First, you can never go wrong with a thank-you. 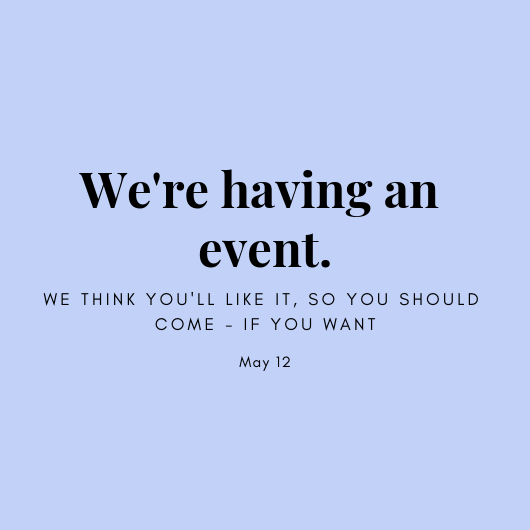 They came to your event, and it’s not easy to get people to do that – thank the ones who do and you’ll probably see some repeat attendees at your next one. Second, get feedback. If you don’t, how do you know if people liked your event? How will you make it better?. 80% of reviews come from follow-up emails asking shoppers to review their purchases. Finally, the recap. Depending on the kind of event you host (webinar vs. in-person or sit-down vs. networking), people might not be able to take notes. So remind them. This email does that with video. Did you know that video email marketing boosts conversions? Click-through rates increase by 200 to 300 percent. How would you respond to an event email like this? It’s a little wordy, don’t you think…? I don’t know about you, but I’m not going based on that email. What’s wrong with this event email copy? (“Everything” doesn’t count as an answer). What kind of event is this even? You have no idea why attending is worth it. Who do you meet? What do you learn? Like any other email, you need to make it worth the time to read. A documentary about the color gray is more interesting than this email. Fear not, your event will have all the attendees you desire – if you follow 3 easy-as-pie tips to make your event email copy great. A personalized email message increases transaction rates up to six times more than a generic message. The subject line is your first impression. The goal of the subject line is to make people open the email – and the best way to do that is to make them curious. Subject line got you feeling stuck? Try our Subject Line Generator tool. People need to know every detail about going and the reasons why they can’t miss it. Give relevant info that will help them actually attend your event. Congrats! You have everything you need to send an event email. Here are a few final suggestions to give your event email an even better chance to convert. Offer an early sign-up discount. 64% of event planners believe early bird discounts to be the best promotional event for an event, according to a report by BizBash and Eventbrite. Use testimonials from past attendees. According to the Spiegel Research Center, 95%of shoppers read online reviews before making a purchase. So, one last thing – am I invited? Just kidding!